← Babylon the Great – the long version. Revelation 14 verse 8. What do we religious folk always say? Don’t take the mark, you will go to hell because of it! It was not until recently that I heard someone read this verse with distinction; it was then that I understood that there are three parts to this unforgivable betrayal. What is it to worship? Worship here is the Greek word proskuneo – (meaning to kiss, like a dog licking his master’s hand); to fawn or crouch to, that is, (literally or figuratively) prostrate oneself in homage (do reverence to, adore): – worship. Where do we see this? 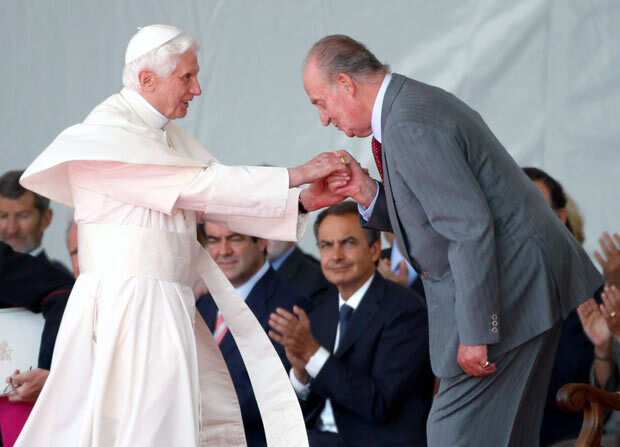 People bowing to the pope, and Muslim men commanded by the Qu’ran, bow three times a day to Allah. 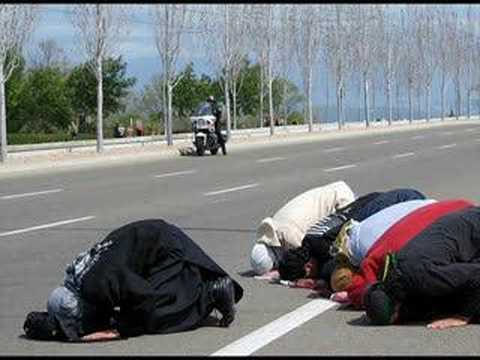 Bowing to Allah. They do this three times a day, where ever they are. How does one portray the worshiping of an idol made to signify or resemble the beast, especially when the beast has the potential to be a demon (Allah), an ideology (Islam), or a man (the Mahdi)? and have the mark of the beast on your hand or forehead. Islam is not that high-tech that they will use chips; seeing as the United States government has sold its soul to be in the New World Order, they will demand chipping to buy and sell, but you have not sold your soul to the devil unless you also worship the beast and the idol. 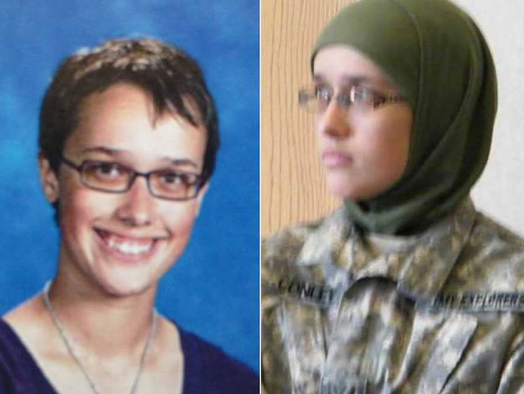 Wearing a burka to show compliance. 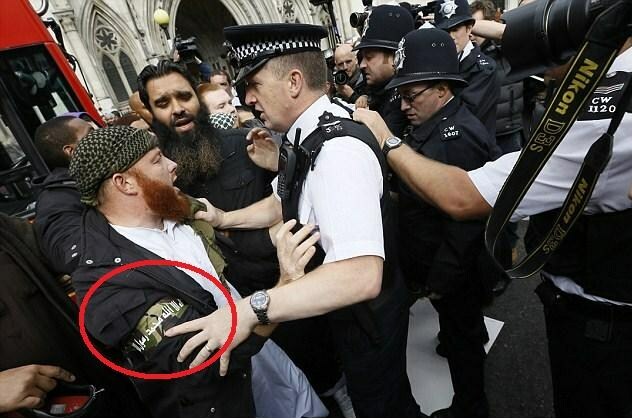 A young Brit who has joined the Mujahid in London, and wears an armband to signify which team he is on. #3 Shows you the fashionable head bands you can choose from. Here it is September 15, 2015. The age of civilized man in a high-tech world. We are on the brink of nuclear destruction once again, and people, as usual, are fleeing tyranny by the thousands. Germany claims they can take in 500,000 refugees. There is only one small problem, we are taking in the bad guys right next to the decent and worthy. So how do the incoming refugees reward and thank the Germans? 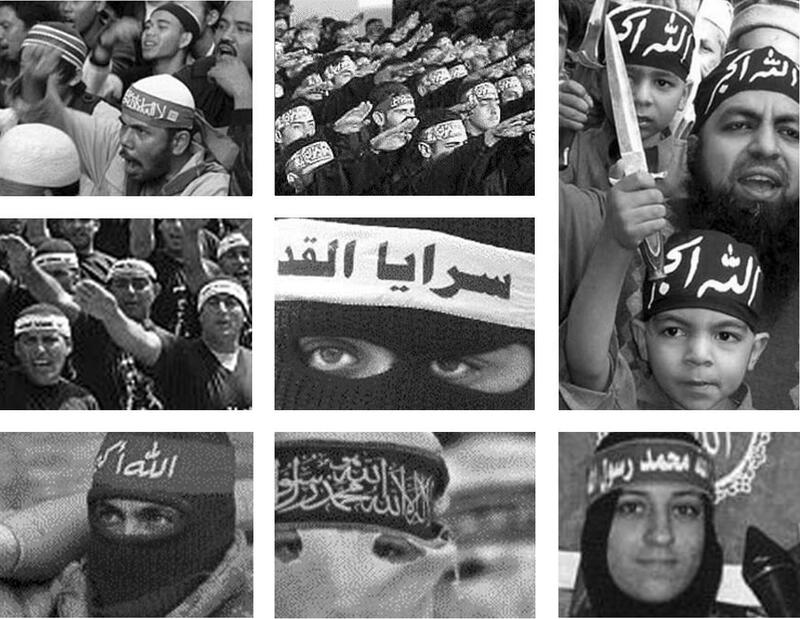 They hang banners on the overpass that say, “All your children will pray to Allah, or die!” See the image included. Demonstrating their gratitude for sanctuary, the Muslims hung this banner that says, all your children will pray to Allah or die. I cannot say with a certainty that many of the things we see in Revelation are not already upon us. I can say with a certainty, that we are not under God’s wrath. The trigger for that is when the church is lifted from the earth. The book of Hebrews, in chapter nine, tells us that He is coming for those who are awaiting his return. I can tell you that many in church scoff at me, and say the same standard, thoughtless line we have heard for generations, people have said that He is coming for two thousand years. I suppose for me, it is the ability we have to pay attention to the signs, and they are all around us. If he comes while you are not looking for him, then you will have to endure what is to come. I really do not want you to have to go through that. Try this: Tell him your sorry; that you are not in control, and you would like him too come in and take over. Tell him that you understand that Jesus Christ died for you and that you have a hope in heaven with the Father. He will come into your life and make you His own. You will still have the right to make idiotic mistakes, and you will, but you can know that you still belong to him, just as I did. This entry was posted in Apostasy, Deception, End times, Prophetic, Thoughts on scripture and tagged Bible, Christ, deception, end times, Islam, last days, mark of the beast, Pope, prophecy, rapture, Revelation, Scripture, the image of the beast, worship the beast. Bookmark the permalink.